ADDRESSING this year’s Sinn Féin Ard Fheis, Senator Pearse Doherty spoke passionately about the hardship and poverty facing people living in the west of Ireland as they suffer what he calls “death by a thousand cuts”. He said that, as a proud west of Ireland person he, like every other person from Malin Head to Mizen Head, demands fairness. A campaign to ‘Save the West’ is to be launched in the coming weeks. Leading the campaign are Martin Ferris TD and Pearse Doherty. Pearse is on the Oireachtas Committee for Arts, Sports, Tourism and Community, Rural and Gaeltacht Affairs, which he has got the backing of for a report he is compiling into the needs of people in the west of Ireland (see box). The ‘Save the West’ campaign has its origins in speeches that Martin Ferris and Pearse made at this year’s Ard Fheis when they spoke about successive governments’ neglect of the west. “Out of the Ard Fheis debates, we decided to call on all political parties and various organisations to begin a fightback for the west,” says Senator Pearse Doherty. But isn’t every region going through problems with services? If someone gets sick on islands like Tory when the weather is bad there will be no ferry so you call the Coast Guard to helicopter you to Letterkenny Hospital, after which the patient has to be driven to a hospital – maybe another four hours to Dublin. And on the mainland, getting to the proper medical facility can also be horrendous. “In the north-west there’s no radiation unit for cancer patients so people have to go to Dublin for about eight weeks’ treatment, either driving to Dublin and Donegal and back to Dublin and Donegal again or staying in the capital away from their families at the time when they are most in need of family support. I heard recently of a woman from the west who opted for a mastectomy rather than place a heavy burden on their families by travelling hundreds of miles to Dublin for treatment. The lack of infrastructure and the decline of livelihoods – “the old fundamentals” – like fishing and farming is driving young people of out of the west. “Of the many young people who travel to places like Dublin for third-level education, few return, leading to the depopulation of the west coast and in Gaeltacht areas a reduction in the number of Irish speakers. The journey between Dublin and Gweedore in Donegal is about four and a half hours each way by car – if you have a car. “The public transport consists of a bus service which only takes you to Letterkenny, after which you’d have to find your own way to Gweedore 32 miles away. There’s a bus going once a day but it only brings you half the way back, after which you have to get a taxi costing €40 to get you into Letterkenny again. “That takes a big toll off the likes of a pensioner trying to collect the pension or do the shopping.” But Pearse Doherty says this is the norm and that for many people the situation is far worse. That’s why any campaign needs to involve a broad range of groups. Martin Ferris and Pearse Doherty plan to visit every county in the west. “Martin will visit the counties on the southern end of the west coast and I’ll visit Donegal, Leitrim, Mayo and the counties at the more northerly end. Pearse Doherty feels passionately about the neglect of the west. At the moment, he says, he believes counties are scrambling for basic resources. “What we should be doing is standing together for the services for people that are their born right as Irish citizens. “We should do the joined-up writing in terms of materialising the right to all of the amenities that allow you to live a full life. “We must come together under one banner and agree a platform to work for the best interests of the neglected people of the western coastline. 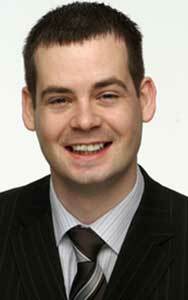 SENATOR Pearse Doherty is encouraging people – individuals and organisations – to send him their views for his Oireachtas report into the needs of the west. The report is due be presented to the Committee before Christmas. Pearse can be contacted at [email protected] oireachtas.ie or Senator Pearse Doherty, Leinster House, Kildare Street, Dublin 2.